This fascinating video surfaced on the Internet last week; it uses a revolutionary microscopy technique that shows the workings within healthy living cells. Although other researchers, including Janelia Farm Fellow Philipp Keller, have used plane illumination to great effect to study multicellular organisms hundreds of microns in size, the light sheets were still too thick to work effectively for imaging within single cells only tens of microns in size. The main problem is that the wide swath of light used in plane illumination exposed more of the cell than Betzig's group wanted. This caused excessive blur and light toxicity. 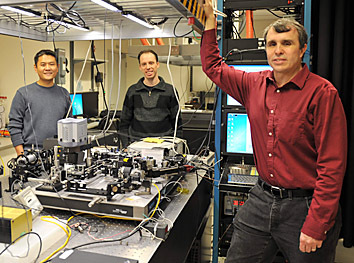 To circumvent this problem, his group used a Bessel beam, a special type of non-diffracting light beam studied by physicists in the late 1980s, and used today in applications including bar-code scanners in supermarkets. Sweeping the beam across the sample creates a thinner light sheet, his group found. When I was a kid, the best depictions of living cells were presented to us in the form of a science fiction movie - Fantastic Voyage. Reality is amazingly more fantastic! Via MedGadget and New Microscope Produces Dazzling 3D Movies of Live Cells (HHMI press release).